And its victims? The 125 odd crore of Aam Aadmi who tried to support the mad emperor and his equally mad scheme. Come November 8, 2017, it will be one year since the Prime Minister Narendra Modi made the grand announcement to demonetise 84% of the country’s legal tender. As grand announcements go, this one tops the charts – filled with valiant sentiments, exhorting 125 crore Indian citizens to sacrifice their convenience for the greater good of the nation. The citizens were told that with some sacrifice, black money, corruption, Benami transactions, terrorism and counterfeit currency, among other evil things that haunt India today, will be eradicated. Close to one year after the announcement, it is now clear, even to the most ardent admirers of Mr Modi, that demonetisation has been an abysmal failure – a failure which not only exposed the PM’s colossal hubris but his utter lack of understanding of the functioning of the Indian economy. A relook at the points of failure of demonetisation will make for a salutary lesson. Mr Modi seemed to have made multiple errors in judgement. First, in thinking that demonetisation is going to cure India of its numerous maladies and next in assuming that the hardships imposed by demonetisation will go away in two months. Much was said and done about how the black money stashed under mattresses, in closets and other such dark places, will be made useless after demonetisation. The public was baited with the estimates of 3 to 4 lakh crores of black money that would not be returned to the RBI but instead will be deposited in people’s Jan Dhan accounts the government. Visions of black money hoarders dumping their dirty currency in rivers and canals or setting them on fire in helpless fury made regular headlines in the early days of demonetisation. But one month into the exercise, it was clear that all the demonetised currency was on its way back to the RBI. By December 15, with still two weeks go for the last date of currency exchange, 12.44 lakh crores out of the total Rs. 15.44 lakh crore of demonetised currency was back with RBI. The estimate that Rs. 3 lakh crore black money will be unearthed, started to look shaky. Many economists pointed out that since only 4% of India’s black money (government’s own estimate) is held in the form of currency, most of the currency will come to the banks. Then Mr Modi, being the nimble political player that he is, changed his tack. Now the fight was not against black money anymore but on cash itself. The next 15 days, Mr Modi and his machinery spent much of their time in making people feel guilty for possessing cash, for using cash and for even thinking of cash. Gone was the talk of black money. Now cash was the new malady, which he was determined to eradicate. This too turned out to be a dead end. With no reliable internet connectivity in much of the country, few smartphones and not enough PoS machines at the retail stores – Indians refused to be coerced into using electronic money. The economy shrunk as a result, with the growth rate falling to a three-year low. The rural economy was particularly hard hit, despite the bumper crop. Thousands of small business units, employing millions of Indians went belly up due to the lack of demand. Many a migrant labour went back to their villages for lack of work. Mr Modi drained the lifeblood out of the Indian economy along with the cash. 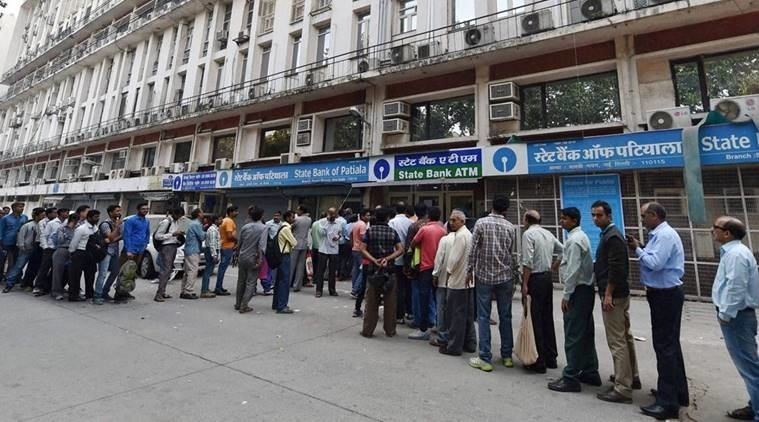 The new infusion of cash came in such slow spurts that the economy continues to limp till date. Even now, after nearly one-year, full remonetisation has not happened. Compared to the first day of demonetisation, the economy is still short of Rs. 2 lakh crore cash. All the hype about Indians shifting away from cash to electronic money remained at just that. According to the latest data available, the transactions using credit and debit cards at PoS as well as instruments like mobile wallets has increased only by Rs. 19 thousand crores since the month of demonetisation. An increase of 19 thousand crores can hardly compensate for a cash shortage of Rs. 2 lakh crores. This small increase in the cashless transactions was something that was happening anyway over the years. It did not need the wholesale sacrifice that the PM was demanding of his subjects. Coming to the promise of eradicating terrorism, the less said about it the better. With demonetisation, the PM vowed to put an end to the dastardly deeds of the villains, who come and operate in India with bundles of fake currency printed in Pakistan. Sadly, the terror attacks show no sign of declining even now. In the entire year of 2016, 382 individuals - both civilians and personnel of security forces died due to terror-related incidents. This year, with still two months remaining, already 315 people lost their lives in such attacks. The simple fact that terror-related deaths have fallen from 2200 in the year 1995 to 1650 in 2005, and then to 336 deaths in 2015 - all before demonetisation - indicates that there are probably better ways to deal with terrorism. By reducing the complex problem of terrorism to a simple issue of fake notes, Modi set himself on a course for a failure from the start. As it turned out, only 0.0027% of the Rs.15.28 lakh crores of currency returned to RBI was counterfeit. 100 people lost their lives and the country went through a trauma just for a measly 0.0027% of counterfeit currency? To add insult to injury, even before the deadline for demonetisation was over, counterfeit notes of the new notes were doing rounds. Just two weeks into demonetisation counterfeits 2000 rupee notes were found on terrorist killed in Jammu and Kashmir. What does it all of this boil down to? 98.96% of the demonetised currency is back with RBI. And it wouldn't be hard to accept that the paltry Rs. 16 thousand crores that have not come back may just be the un-exchanged cash of poor people - who could not exchange their cash because Mr Modi abruptly shut the window for exchange on December 31. Even after he promised that everyone can still exchange their currency at RBI branches till March 31. The country has spent Rs. 21 thousand crores in printing new currency and much more in terms of the income and employment and businesses that were lost and destroyed. The people who did have black money, some of whom are BJP leaders, quietly converted their currency through various means. Some people like Amit Shah’s son Jay Shah, have thrived even under demonetisation. As the recent kid-glove treatment given to Adani in the coal scam and power equipment scam shows, it is business as usual for crony capitalists and corrupt politicians. Demonetisation boils down to the biggest political scam, India has ever seen, run by its Prime Minister. And its victims? 130 crore odd India’s Aam Janata.